EasyCart offers several cart import methods that can quickly get your data from popular platforms. They may not be perfect and bring across every single piece of data, but they can certainly move a bulk of your product data over. For a full list of what they import, please read each section for each importer. 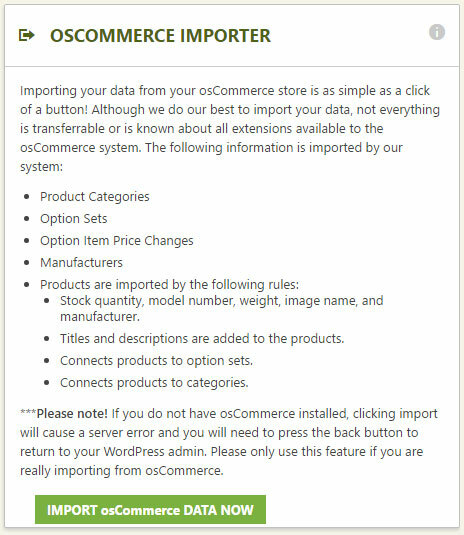 To utilize the WooCommerce importer, you must have both Woo and EasyCart installed on the same WordPress site. 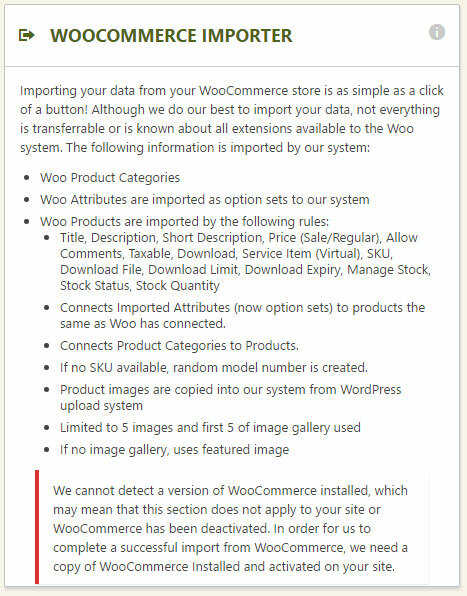 EasyCart will detect if it finds WooCommerce installed and then you may begin the import process. EasyCart can import most of your products and product data from osCommerce into EasyCart. Please read the details in the importer section as to what specifically is imported. You must have osCommerce installed along with EasyCart for the importer to detect and work. SquareUp is a popular payment processor and point of sales terminal system. You can now import your square products and options directly into EasyCart with one click. You must go to settings -> payment and setup Square first. This authorizes the app and makes your connection available for the import process. Once you are connected with payments, you can come to this panel and import products. 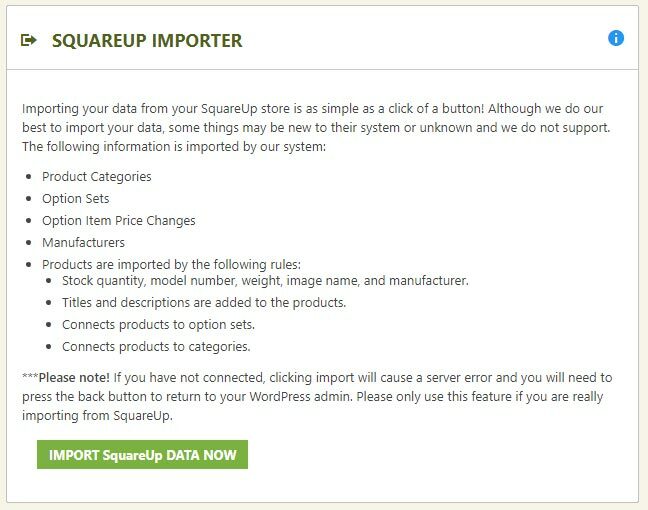 Note: One important note you must consider, if your importer fails, try disconnecting and then reauthorizing your SquareUp app so that you have updated permissions. Older users connected to Square will not import due to lacking accessible permissions. A reconnect will resolve this issue if you run into this situation.